Or at least that was what I was led to believe by seeing countless articles about autistic kids and the tremendous bonds they developed with their pets. So much that I felt guilty of denying my kids the opportunity. We had been a petless family since just before my twins autism diagnosis – I had no interest in getting another pet after my senior cats crossed the rainbow bridge. That feeling remained over the next 5 years, because with all the attention my kids demanded, I didn’t think I had much left for an animal. In fact, I KNOW I would have resented any attention they would need. Life started to get a little easier 5 years later – when my twins didn’t require 24 hour surveillance . 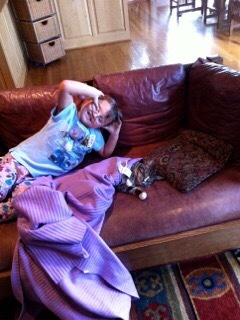 My daughters had been pleading daily for a cat; my twins were indifferent. We decided to add a feline to the family. Enter, Joe a 6 month old cat from a local animal rescue. The kids were overjoyed with Joe’s arrival initially and the girls developed a rapport with Joe. We noticed the boys didn’t interact with him all that much. They enjoyed talking ABOUT him, but didn’t seek him out. 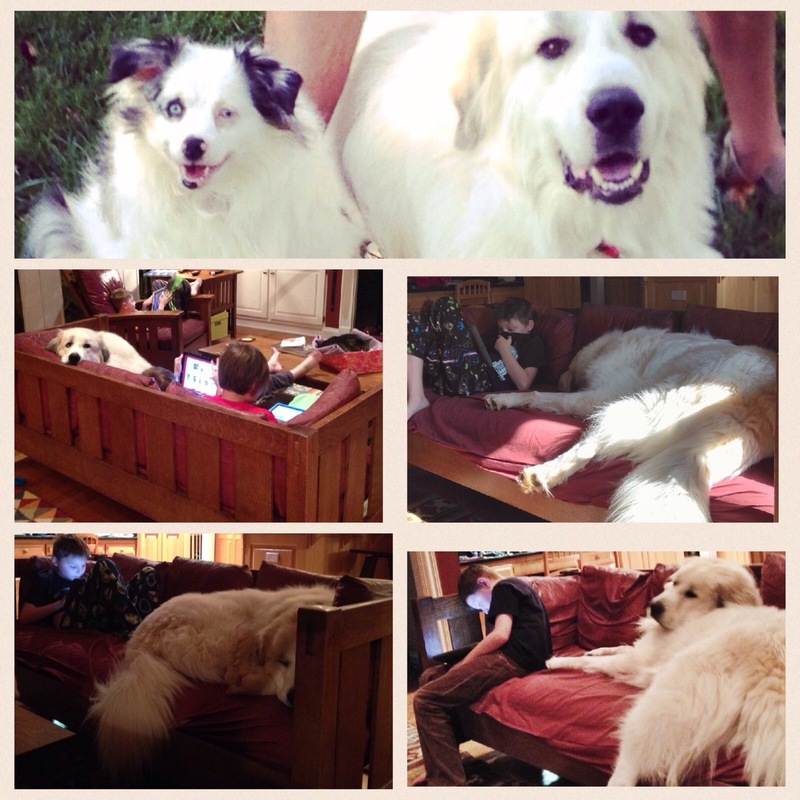 We coexisted with Joe for a year until I started reading about the child / dog bond again. We investigated service dogs but realized that our sons didn’t need that level of involvement. We came across an organization that rescued dogs and trained them to be therapy, service and companion dogs. They had companion dogs available for adoption regularly. All of their dogs were behavior tested before being accepted into their program so we contacted them to see about obtaining a dog through their program. Pawsibilities Unleashed. We went to the training facility to meet some young lab’s that we saw on their website. Within moments, it was evident that my twins (who were 8 at the time) were not enjoying their high energy. The owner told us she had recently rescued a dog that she thought would be a good fit us. We followed her to her house and there we met Sunny – a 3 year old miniature Australian Shepherd who had been rescued from a puppy mill where she was used as a breeding dog. She owned us in short order after she scooted onto my sons lap when another dog entered the room. We had high hopes that the boys would bond closely with Sunny. You may notice a trend in the next set of pictures. 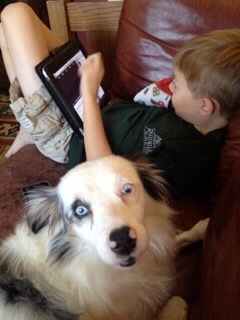 As the photos indicate, they liked Sunny’s company, but they liked their iPads more. We also discovered that Sunny didn’t know how to be a dog – she had no concept of how to play like a dog (an effect from being a puppy mill dog evidently). She was the sweetest, low maintenance dog you could ever ask for. Two years pass and we started to think about getting another dog. Not just for the kids, but also to help Sunny learn to be a dog. 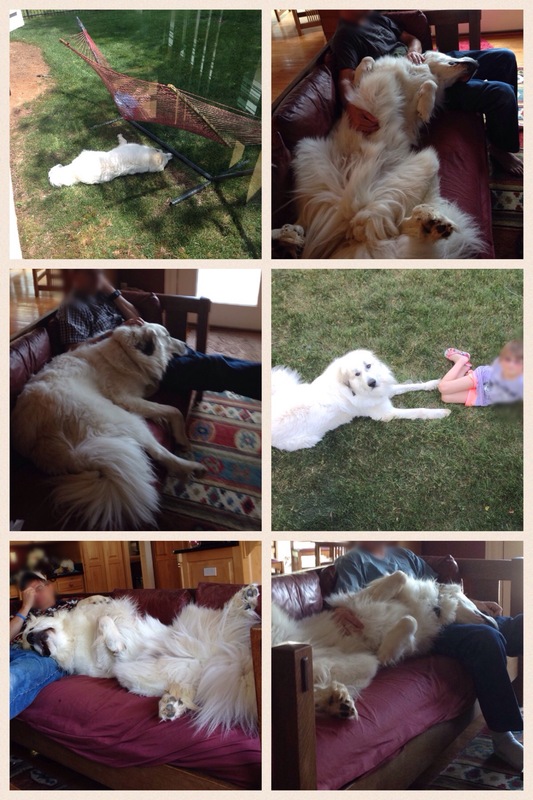 I followed some local animal rescues and heard about a 2 year old Great Pyrenees that needed to be rehomed because of wandering onto someone else’s farm property. After doing a lot of research on the breed, Olaf came home. We knew our twins were disturbed by small, hyper dogs. 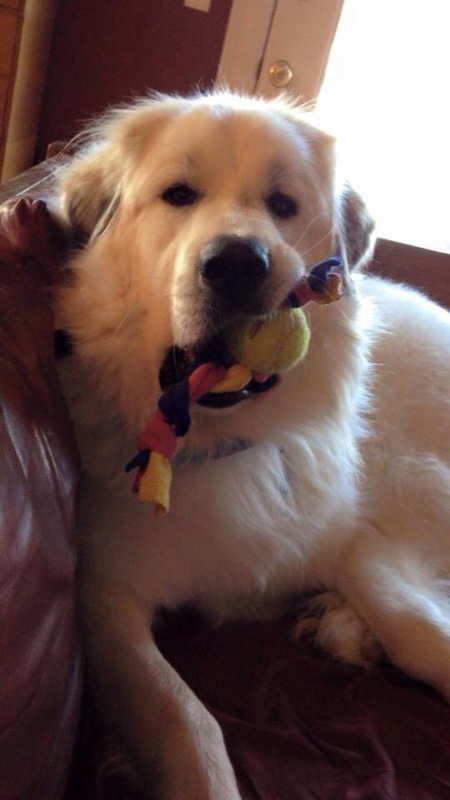 Olaf was colossal and mellow. 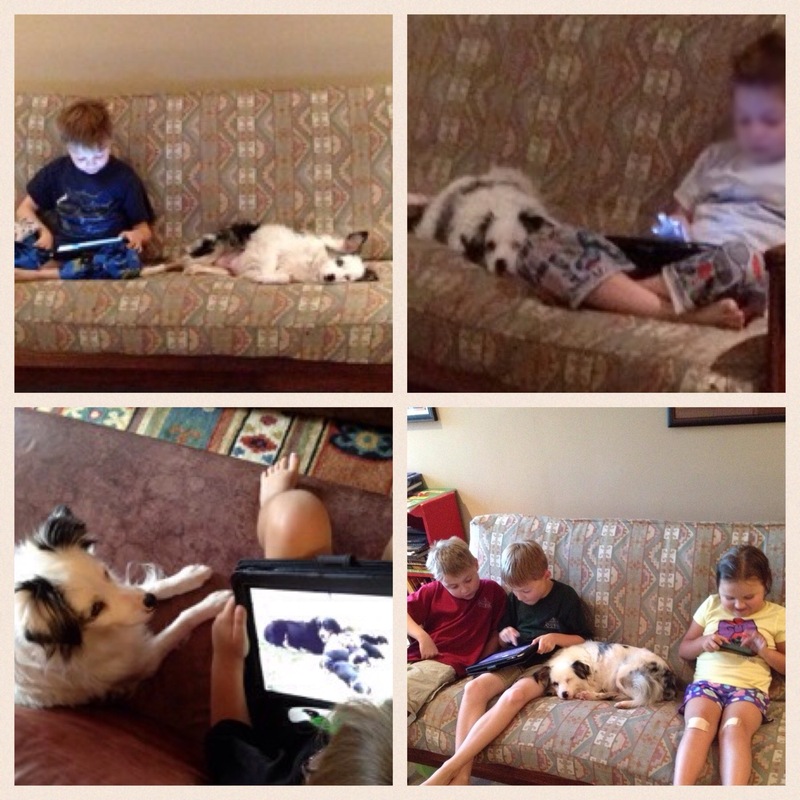 We couldn’t wait to see how Olaf settled into our house and for the special bonding to begin. Olaf is a family dog – his job is tending to his flock and he is very thorough in his execution of that task. So thorough, he’s often in the way of the kids. Then, there’s the white fur covering everything….the smell he can emit….the LOUD barking when he has to protect his home from the woodland creatures and well, he gets on their nerves quite often. As summer has begun though, Olaf accompanies the kids on their trips to the backyard and they love that. He has tried to console our kids when they are hurt, upset etc by leaning on them (they’re not big fans of that). Lest anyone think Olaf isn’t getting any attention, let me assure you, that is not the case. In fact, he thinks he is a lap dog and is always there to take up the entire couch when sports need to be watched. I think I have finally accepted that my kids aren’t going to develop that special bond, I kept reading about with their pets. They love their pets, but on THEIR terms. So, I’m going to have to bust this myth for my family and and while it took 3 pets to confirm this, I can at least be thankful we didn’t spend $25,000 for a service dog that likely would not have had much different of an impact. For any families that DO have that bond, I’m happy that is the case. My husband and I have our “therapy” animals. For those who are thinking about getting a pet, but aren’t sure if it’s worth the extra responsibility, I can’t answer that for you. Do what is right for your family, and your situation.